The Isle of North Uist occupies a central position in the Outer Hebrides - the Western Isles chain which lies forty miles off the north west coast of Scotland . North Uist is linked by causeways to Benbecula and South Uist and forms the lower half of " The Long Island " along with the northern isles of Lewis and Harris . North Uist can be reached by CALMAC's roll-on/roll-off car ferries from Uig on Skye to Lochmaddy ( 2 hours ) and from Oban to Lochboisdale on South Uist ( 6 hours ) . Flights leave daily ( ex. Sunday ) from Glasgow Airport British Airways to Balivanich,Benbecula . 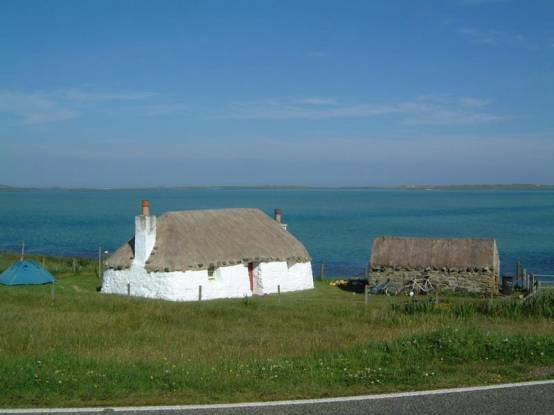 Struan Cottage lies 10 miles from Lochmaddy ( principal town of North Uist ) on the 35 mile circular road which has short branches off to townships such as Locheport and Otternish ( causeway to Berneray and CALMAC ferry to Leverburgh in Harris ). The cottage sits 50 yards from the roadside on the bay at Vallay Strand with picturesque views to the now uninhabited island of Vallay. The cottage was built in the 19th century and has been recently modernised to combine all the benefits of modern amenities with the original appearance of a traditional, thatched cottar's whitehouse . The cottage comprises one double bedroom with single sleeping loft, living room/kitchen with sleeping loft for two and a toilet with shower . Cooking and heating are by electricity with the opportunity for using solid fuel stove .A fridge is provided . Tenants are asked to supply their own bed linen (the beds have downies so covers will be required ) . Our traditional thatchers, John and Angus Alec. Lochmaddy is the main town with ferries to and from Uig in Skye and Tarbert in Harris . It is the islands business centre with The Bank of Scotland , Post Office , Court House , Police Station , Doctor , Hotel , shops , petrol station and tourist office all to be found here . 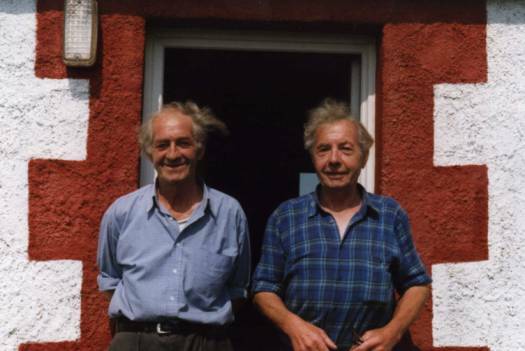 1999 was the centenary of the crofting of Sollas click here to see photos and a variety of events happened in July 1999. Today all the crofts except one are occupied by descendants of the original crofters who settled here a century ago. 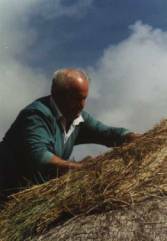 Many of these original crofters came from Heiskeir(click here for more info.) . In Sollas , 1.5 miles from Struan Cottage is the Co-op store ( open Mon - Saturday ) which has a good stock of tinned,frozen and fresh produce as well as an off-licence . There is also a Post Office in Sollas . 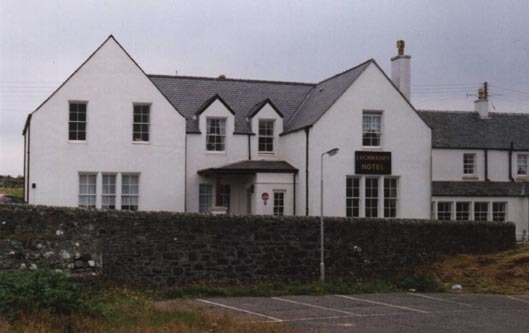 Four main hotels in North Uist serve bar and evening meals ; Lochmaddy Hotel , Westford Inn , Langass Lodge and Caranish. Taigh Chearsabhagh is the Arts Centre, it oten has workshops and events. Also has a nice cafe. The Isle of North Uist , unspoilt by tourism , provides a unique opportunity for those who wish to relax and explore and where the pace of life allows space for reflection . The island is flatter than South Uist, its highest hills,Eaval and South Lee being 1,139 feet and 898 feet respectively standing on the eastern shores of the island surrounded by a jigsaw of glistening sea and fresh water lochs ( O.S. Maps 18 & 22 ) . 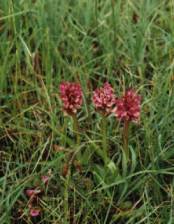 The west cost of the island with the rolling machair land bordering the Atlantic Ocean is lush in vegetation and carpeted with wild flowers . Its miles of silvery sands are frequented by wild birds. Balranald is where the RSPB reserve is situated . The reserve is 3 miles from Bayhead ( Paible ) turning left off the main road at Hougharry . The summer warden can be contacted at the reception cottage at Goular near Hougharry , not at Balranald . The 1500 acre reserve was set by an agreement with crofters and comprises a wide variety of Hebridean habitats ranging from beaches to lochs and flower clad meadows .For details of sightings and Uist wildlife in general visit Western Isles wildlife North Uist is a paradise for those interested in ancient historical sites with prehistoric forts ,wheelhouses and chambered cairns many in good condition .With its myriad of sea and freshwater lochs North Uist is an ideal holiday venue for the keen fisherman . Permits and information can be obtained from the Lochmaddy Hotel . The main industries on the island are crofting and fishing . The lobster fishermen land their catch on the island of Grimsay , linked by a causeway to North Uist . Here the lobsters may be seen . They have a shellish market at Kallin Peir on Saturdays 11am - 2 pm. An excellent fish store is Mermaid Fish Supplies near Clachan offering a wide range of smoked fish . Telephone - nearest public call box is approximately 3/4 mile from the cottage towards the villlage of Sollas . Fuel - We have a large peat stack Coal can be purchased from the Co-op in Sollas or from Morison's shop in Lochmaddy . Peat can occasionally be bought locally . Petrol - the nearest petrol stations are at Bayhead and Lochmaddy .